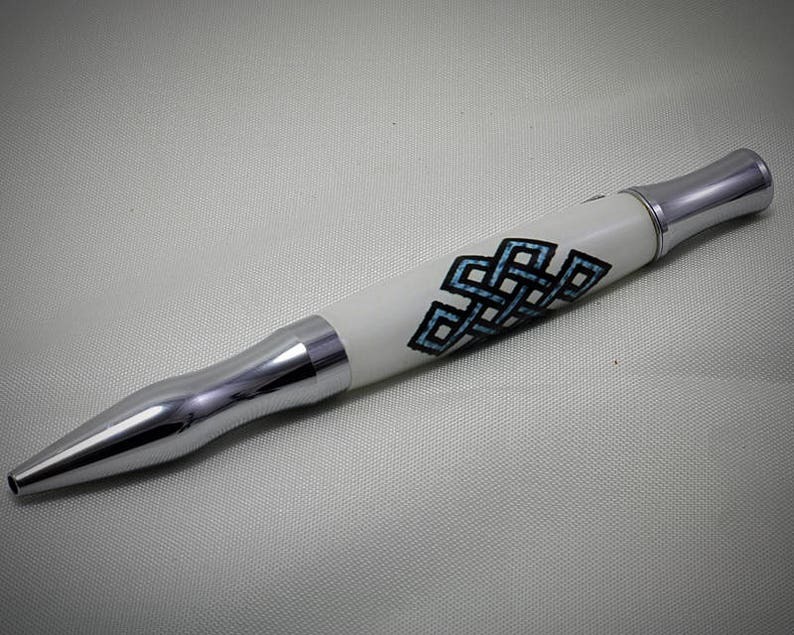 This High Quality Ballpoint Pen features an image of a turquoise diamond cluster on a white background, cast in clear acrylic resin. The nib end of this pen is concave, which provides a very comfortable writing experience. This is a very stylish ink pen! +Ballpoint Pen (Virage Style). The pen that is pictured is the pen the buyer will receive. +This pen accepts a “Parker ®” style refill. Length 3.875” (9.84cm) Diameter .22” (5.8mm). Ohio Penworks installs a premium quality Schmidt medium point easyFlow 9000 refill in the buyers choice of black or blue. “Parker ®” style refills are manufactured by numerous companies including Acme, Fisher Space Pen, Parker, Monte Verde, Pelikan, Schmidt & Visconti. They are available wherever office supplies are sold. +Approximately 5 1/4" long, 9/16" at it's widest point.